Did you know that a study found drinking 1-3 more cups of water per day led to participants losing 1-2 pounds per month with no other changes to diet or exercise? Weight loss and calorie control, along with clearer, radiant skin, and healthier immune system are some of the endless benefits of drinking water. But you’re missing out on these amazing benefits by not drinking the recommended 8-10 cups of water per day. We came across a new hydration health trend that’s taking the dehydrated world by storm and making it really hard for us to use our “water is boring” or “I can’t remember to drink water” excuses. We love the ease and convenience of this bottle, not to mention making water taste more interesting, but sticking a couple of slices of lemons into this bottle really wasn’t going to do it for us. 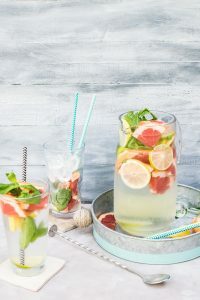 So we did some experimenting, and here are our top 5 favorite recipes that makes your mouth water (so you better hydrate)! 1. 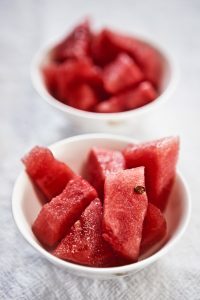 Mint Watermelon – Ok, so we might be watermelon fiends here are Ocean Simplicity. But come on, sweet, refreshing watermelon with a kick of mint. Hot weather has never tasted better. 2. Basil Strawberry – For our friends who want to get a bit gourmet, this is the perfect flavor profile: sweet, a bit tart, and that surprising aromatic scent of basil that reminds you of everything delicious. 3. Cucumber Kiwi – As relaxing and refreshing as that day in the spa, but with a twist of that floral, melon-y, sweet kiwi taste to wake up your taste buds. 4. Blueberry Pomegranate Mint – Sweet and calming, vibrant and tart, and just a hint of mint as a throwback to that cool breeze on a summer day. 5. Strawberry Lemon Ginger – Now we’re really getting funky. Flavorful and refreshing strawberry and lemon base with a spicy, tangy punch to keep you energized. These great flavors are really kicking our hydration up a notch, and we’d love to hear your favorites too. 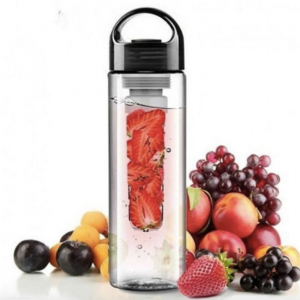 Plus, you can check out these stylish, eco-friendly fruit infusion bottles here.